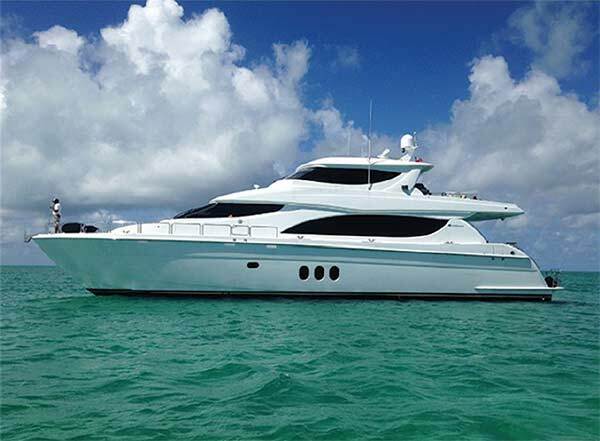 80 Hatteras Motor Yacht for Sale "Halcyon"
HALCYON is an exceptional example of the amazingly versatile and ever popular 80' Hatteras motoryacht. Anyone familiar with this model, already knows it essentially provides all the amenities of most 100' yachts, including 4 staterooms, each with ensuite head, and completely separate crew's quarters with 2 crew cabins, which could accommodate up to 4 crew members (even though most owners typically only need 2 crew, as a general rule). The quality of build, cleverness of space design, and the superb sea-keeping characteristics, are unparalleled in this class of vessel. HALCYON is the desirable SKYLOUNGE model, and was custom built for the first owners, who owned the boat for almost 9 years, and mostly lived aboard, lovingly maintaining her, yet rarely going anywhere, which is why she only has approximately 400 ORIGINAL hours on her reliable Caterpillar C-30 engines, which are still under extended transferrable warranty until October 2015! In addition to the standard main-deck day head, HALCYON also has a SKYLOUNGE day head, which is something rarely found and much sought-after on this model. Her current owner, who is relatively new to yachting has continued to love, maintain, and improve her, but has been bitten by the exploration bug, and so is selling HALCYON with the intention of moving to an expedition style vessel. HALCYON is aggressively priced for a quick and easy sale. Don't miss the boat!